To serve the Lord and His flock as the pastor here at First Baptist Church of Monroeville is both a privilege and a blessing to me. God has taken me through an ecumenical path to this point, as I was raised in the Roman Catholic Church, saved in a United Church of Christ, graduated from an Episcopal seminary, and now am serving as an American Baptist minister. Prior to my call to ministry, I was a regional sales manager for the Zale Corporation where I enjoyed much of what life had to offer. We were a typical middle class family. Denise, my wife of 27 years, and I have shared the blessings of raising two wonderful children, Rachel and David. 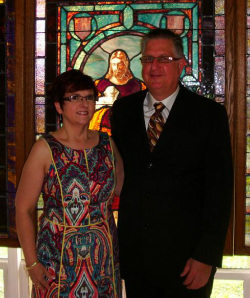 Rachel was married in March of 2010 to her husband, Scott, and David is currently a student at Clarion University. It was in the midst of my employment at Zales that I felt an emptiness in my life. I realized that God was the missing ingredient in our lives and that without Him everything seemed "meaningless." While the later journey to ordained ministry was a long and sometimes difficult road, it all began with a single step when I asked Jesus into my heart during a church service in 1995. I was truly on fire for the Lord and began reading everything I could get my hands on in an effort to know more about my Savior. As time passed, God revealed to me ways that I could serve Him - as a Sunday School teacher, trustee, and eventually in lay ministry. Ultimately, however, I had the sense that He was calling me into ministry, and after much prayer and discernment, I answered His call and began five years of seminary. It was during those five years I began my ministry at East Brady Baptist Church as a student minister. There I was ordained in 2004 and continued to serve until October of 2009. God blessed both my family and our ministry during the nine years we served in East Brady, as we grew from a church of about 15 to a church of 60-70. However, Denise and I both felt strongly that God was calling us to a new ministry, so after almost 8 months of prayer and discernment, we answered the call to Monroeville. Upon my call to Monroeville in October of 2009, Denise and I immediately began to pray about what God had in store for us here. Our desire is nothing more and nothing less than to faithfully serve hand in hand with this congregation as a means of drawing others to Jesus. With this in mind, we have begun a praise band and drama team in an effort to include young and old alike in ministry. We will continue to prayerfully seek new ways to utilize the gifts and talents of all of our members so that others might be blessed through them. God has given us the special gift of one another, making us family - His family. We seek to share the love of Jesus with everyone who walks through our doors, understanding that "people do not care what you know until they know that you care." We pray that all who gather in this church building will share in the peace and joy that God desires all of His children to possess, so that together we can take the message of God's love and share it with a lost and hurting world.